Burfi / barfi is a North Indian sweet, made from milk solids and sugar which is flavored with cardamom or nuts. But in Malabar, a region in Kerala it was the traditional way of storing fruits during seasons or when it is available in huge quantity. Burfi can be made with a wide variety of fruits and vegetables. People love to make this sweet because of its easiness in preparation and can be made with handy ingredients. The most common and popular burfi recipe is Coconut burfi / nariyal burfi. Some other barfi recipes are besan barfi, carrot barfi, Mango burfi, milk burfi, cashew burfi, badam barfi etc. Burfi recipe can be made in different ways . Here i am sharing two methods showing how to make burfi at home, which i learned from my mom. 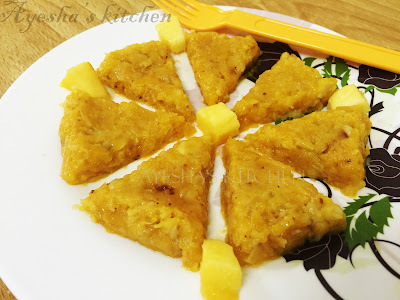 Do try this mango coconut burfi / mango burfi recipe. In a pan, cook the chopped mangoes with desiccated coconut and sugar. Stir it continuously. Pour milk to it and stir well. Let it cook for few minutes. Then add cashews, almonds and mix it thoroughly. When the mix comes to thickens, add the ghee and again stir it slowly until it starts to leave from the sides of the pan. Transfer the mix into a greased tray. With the help of a flat spoon , spread this mixture evenly .Now allow it to cool. Make a small cuts of square or diamond shapes using a knife , when the burfi is warm. Allow the burfi to cool and set well. Once cooled we can easily remove the pieces along the cuts. Serve immediately or you can store it for 1 week in an air-tight container. Heat a pan and toss desiccated coconut in a very low flame for 2 minutes. Then prepare a thick mango pulp by grinding mango pieces without adding water. Now pour the mango pulp to the coconut mixture along with sugar, milk and cardamom powder. Add nuts, almonds and mix well. When the moisture content gets evaporated, add ghee to it and stir slowly until it starts leave the corners of the pan. Transfer it to a greased plate and cut into desired shapes once cooled. Chill before you serve for best result.